Perfect your pores and create a canvas of flawless skin. 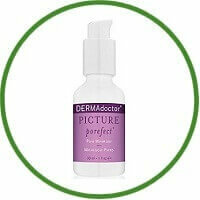 Picture Porefect helps refine and tighten pores within minutes following application. This lightweight, non-comedogenic formulation targets enlarged pores at the source rather than simply covering them up; helping perfect pores with continued use.